As the Chinese middle classes grow in size and wealth, Chinese residents are increasingly becoming international tourists—and the reasons they travel overseas are evolving. 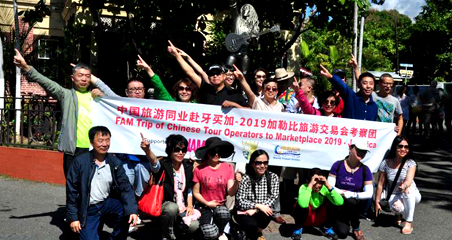 According to a recent survey of 2,000 Chinese travelers by Oliver Wyman, Chinese tourists made 140 million outbound trips in 2018—a 13.5 percent increase over 2017. Chinese tourists are getting bolder, both about where they go and what they experience at their destination—and these changes are affecting where and what these travelers spend their money on. According to The Telegraph, outside of China, the top destinations of these travelers are Thailand, Japan, Vietnam, South Korea and Singapore. And beyond Asia, the U.S. and Italy are their top destinations. Chinese travelers are spending more money at destinations that are farther from home, according to a survey by Nielsen and Alipay, with average spend in the U.S. being $4,462 and average spend in Hong Kong being $2,487 in 2017. The survey shows that “spending by Chinese tourists reached $261.1 billion in 2016” and that, on average, each Chinese tourist spent $5,565 on overseas travel in 2017. This spend is going toward exploring new experiences. 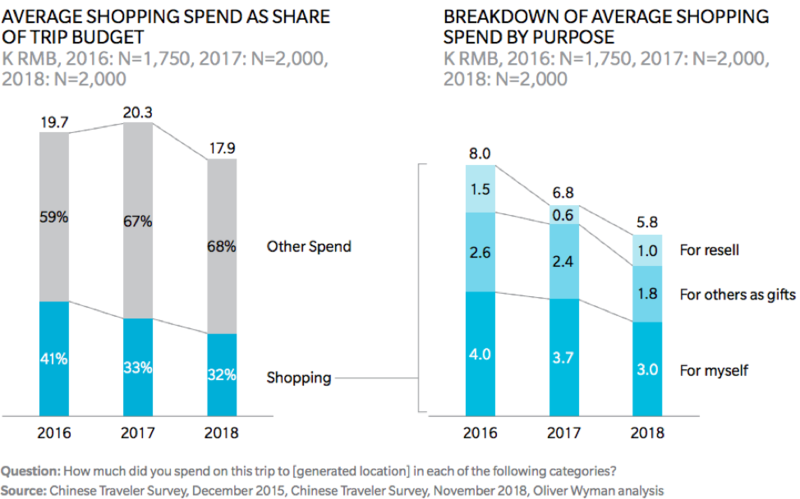 The Oliver Wyman report notes that authentic, social and shareable experiences are now the top reason for traveling—while shopping, as a reason for traveling, has dropped dramatically, from 91 percent in 2016 to 41 percent in 2018. 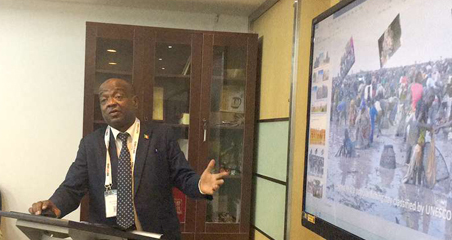 This could have significant implications for companies connected to Chinese tourism right along the value chain. 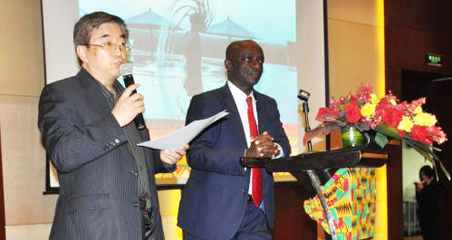 As shopping is replaced by other spend items, the overall spend by Chinese tourists is declining slightly. Chinese travelers are increasingly headed to places like Iceland, Europe and North America. As they seek more authentic experiences, fifty-six percent of the respondents in the Nielsen survey noted that “beauty and uniqueness of a given destination is their primary consideration” when choosing where to travel. Chinese travelers are getting more adventurous in what they eat as well and are increasingly willing to try local cuisines. They often use websites dedicated to ratings and reviews to find restaurants that will allow them to experience the authentic flavors of their destination. 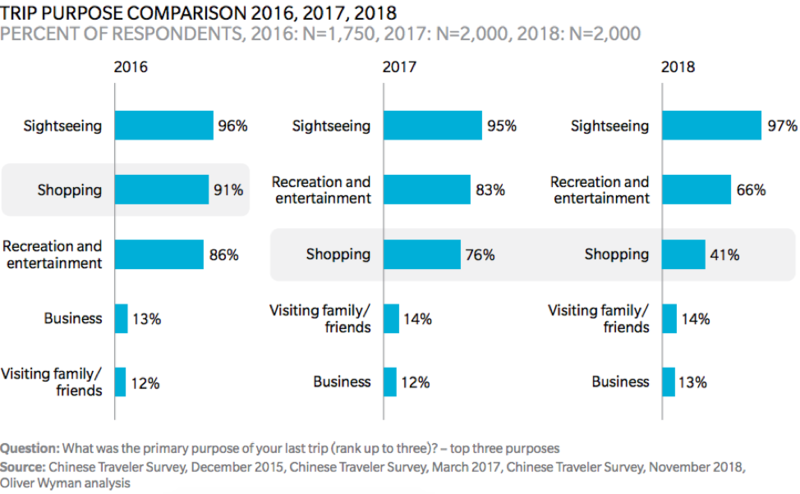 “Travel allows me to broaden my horizons, while offering me a chance to experience other people’s lifestyles and learn about different cultures,” says one survey respondent in the study by Nielsen and Alipay. Along with a greater curiosity for local cuisine, Chinese travelers are staying in more boutique hotels and in the homes of locals. Like restaurants, hotels and homes are at the mercy of online reviews. 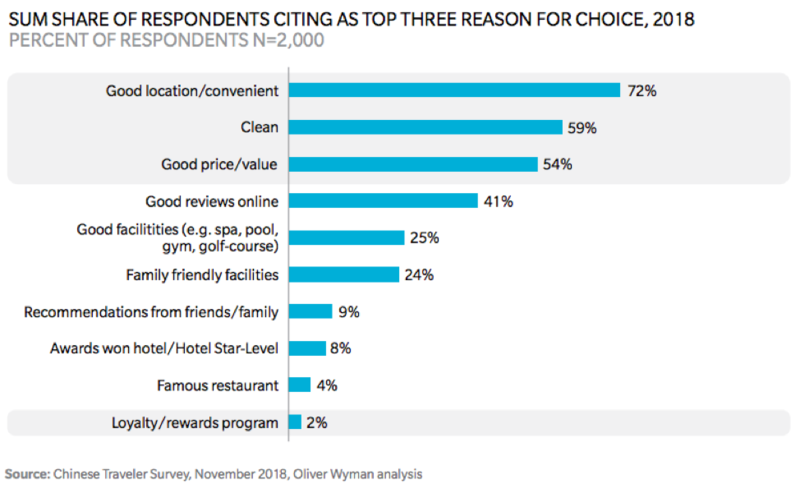 Travelers weigh location, cleanliness and price more heavily than amenities and rewards programs, often associated with larger hotel chains. 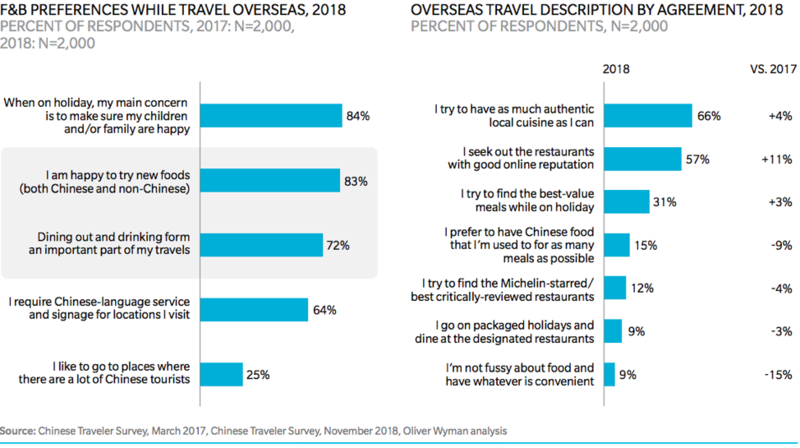 “Given the digitally savvy characteristics of today’s Chinese traveler, marketing to them requires a specific, localized approach,” according to the Olivery Wyman report. Chinese consumers have taken quickly to e-commerce and mobile payments as well as sharing their experiences on social platforms. Eighty percent of respondents in the survey reported sharing their experiences on WeChat, and according to Oliver Wyman, nothing beats WeChat to generate positive word of mouth for your company. By creating a presence on social channels, including platforms dedicated to reviews, companies can manage their reputation, resolve any problems and cultivate positive interactions between their company and the community online—ultimately drawing Chinese travelers to their offerings.